Wishing you and yours a happy holiday and best wishes for a wonderful new year! 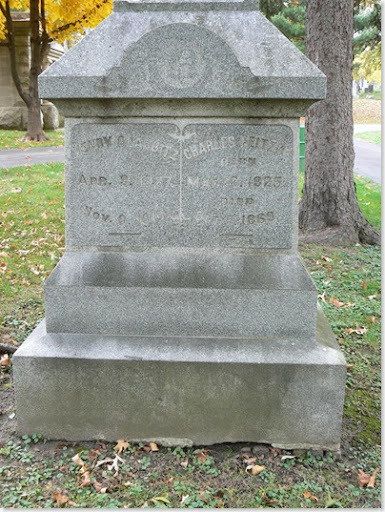 Henry and Charles are buried in Evergreen Cemetery in Bloomington, Illinois (section 3, lot 7). 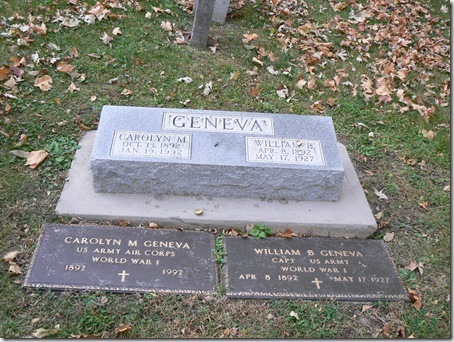 Jan. 19, 1992 William B.
Carolyn and William are buried in Evergreen Cemetery in Bloomington (section B, lot 42). Elyse at The Graveyard Rabbit of Eastern Tennessee posted an article about volunteering during the holiday season. 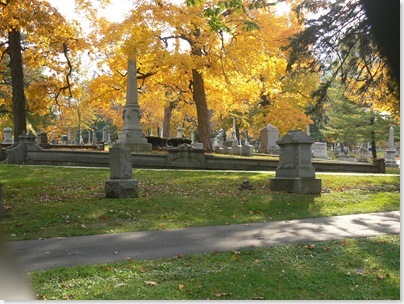 She lists some great ideas for doing volunteer work with a cemetery twist. 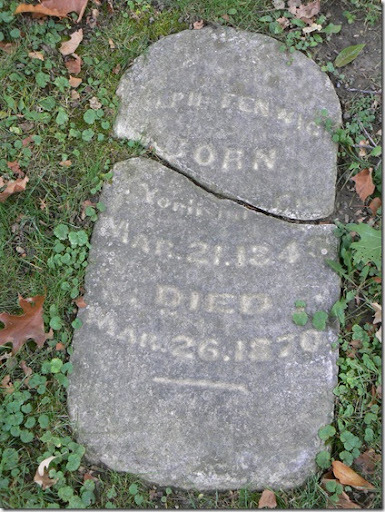 Although I am very busy these days (I'm in full research mode and am trying to put some things together to send to a family member), I will find some time to add my finds to the Find-A-Grave database. I encourage you to read her article. I thought this was interesting. 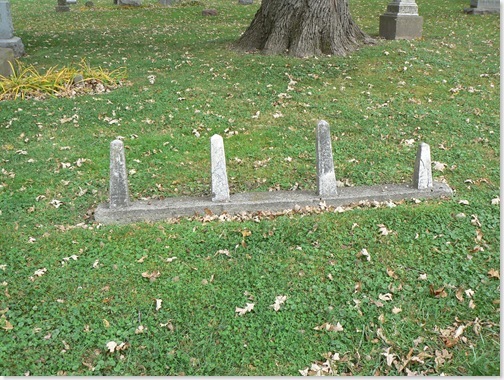 I have no idea who may be buried here. 1 November 2008 by Julie Tarr. 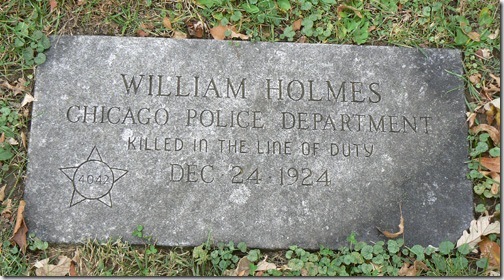 William Holmes was a Chicago police office, who died in the line of duty on Christmas Eve 1924. He was one of the 40% of Chicago police officers who were killed in action during the Dangerous Era (1920-1939). From what I can find, William was enumerator in the 1920 census as living in Chicago Ward 2, Cook County, Illinois with his wife Mary. According to this census, he was born about 1883, which would have made him about 41 when he died. In the early morning hours of 24 December 1924, Officers William Holmes and Jesse McKinney set out to investigate an assault on Giles Avenue. William was taken to Wilson hospital, where he died that fateful morning. William was buried in Evergreen Memorial Cemetery in Bloomington, Illinois. I have no idea what his ties to Bloomington-Normal are. 1. 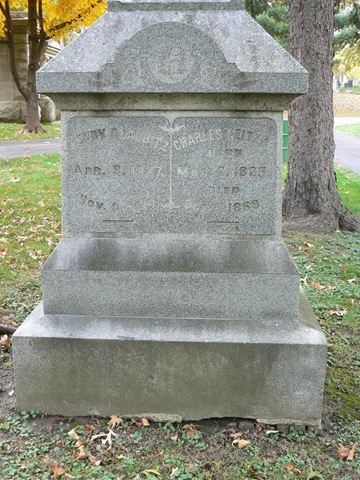 Digital image of William Holmes' gravestone at Evergreen Memorial Cemetery, taken by Julie Tarr on 1 November 2008; privately held by Julie Tarr. 2. 1920 U.S. census, population schedule, Chicago Ward 2, Cook, Illinois, enumeration district (ED) 105, sheet 26A, p. 1, dwelling 20, family 28; digital image, Ancestry.com (www.ancestry.com ). 3. "Courage in Duel With Murdered Wins Hero Prize." Chicago Tribune. 11 January 1925. 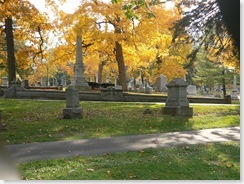 The Evergreen Memorial Cemetery, established in the 1820s, is located in Bloomington, just south of downtown. It's situated on 87 acres, surrounded by Wright Street, Lincoln Street, Wood Street, Gridley Street, and the Norfolk Southern railroad tracks. 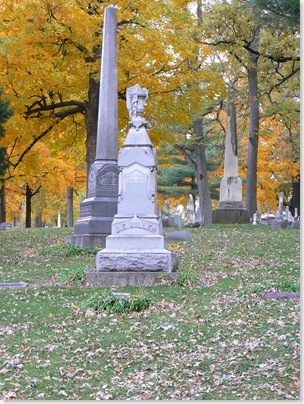 I visited the Evergreen Memorial Cemetery in Bloomington last week and wanted to share some of the Fall photos I took. Enjoy! Here's a listing of cemeteries in the B-N area. I've also created an interactive map (see my GenBlog post for information on creating a Google Map). If you have any information that you would like to share, please contact me. 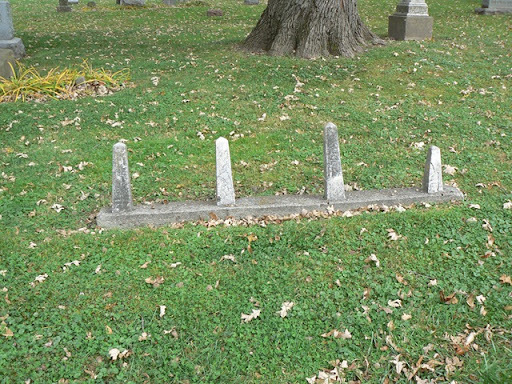 Welcome to the The Graveyard Rabbit of Bloomington-Normal, IL! This new blog is for my membership in The Association of Graveyard Rabbits. 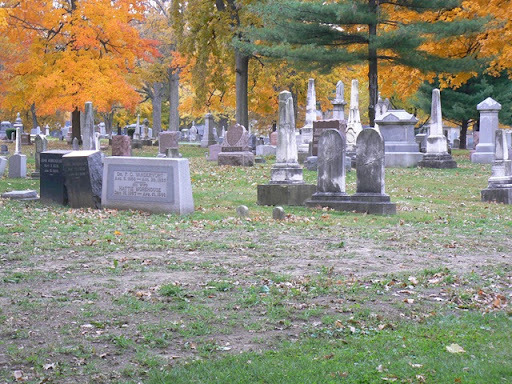 What in the world is the Association of Graveyard Rabbits? 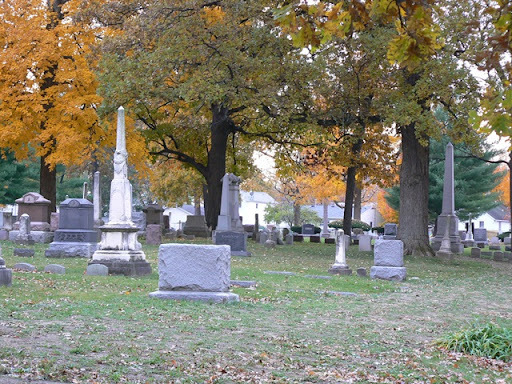 It's a new group formed by Terry Thornton to promote "the historical importance of cemeteries, grave markers, and the family history to be learned from a study of burial customs, burying grounds, and tombstones." It's quite an interesting prospect and I'm honored to have been invited to participate. This blog will focus on the Bloomington-Normal-area in McLean County, Illinois, which is where Icurrently reside. 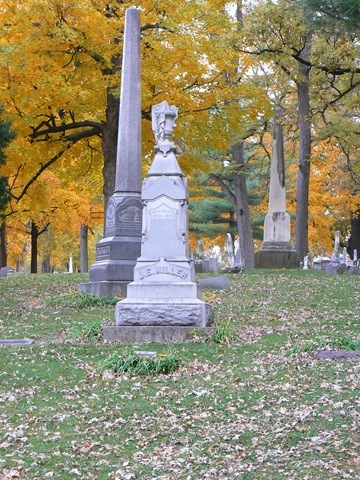 I've also created The Chicagoland Graveyard Rabbit, which is where I am originally from and is one of my bigger research areas.